Defining Globalization: A Guide on How to Use this Book. The Dictionary of Globalization (A-Z). "This thought-provoking and moderately priced work deserves a wide circulation." "The entries are short, to the point and informative. It also shows effectively the breadth of scholarship on globalization." "An excellent review of the key concepts linked to globilazation as well as brief resumes of the ideas of amny key thinkers in the field. A really valuable text for all those working on globalization." "Jones's Dictionary of Globalization provides an indispensable reference guide to the new language of international politics. 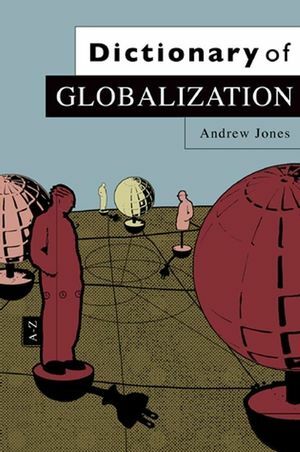 Using a clear and concise format, Jones sets out and describes the multifaceted components, events, ideas, and thinkers on globalization. A different kind of text, Dictionary of Globalization helps the reader navigate the vast and contentious literature on globalization." "Comprehensive and clearly written, the Dictionary of Globalization should appeal to both newcomers and established scholars in the interdisciplinary field of global studies."